Richly adorned with dainty little flowers framed in palm leaves, the Bougainvillea collection speaks of soft, tropical breezes and the easy life by the sea. These lively blossoms easily brighten a springtime buffet, picnic, or breakfast nook. Fine French table linens, hand-printed. Designed by Bruno Lamy exclusively for Couleur Nature. 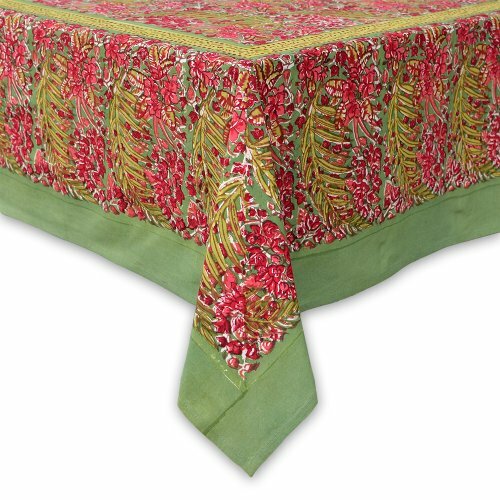 Tablecloths are simply the easiest way to transform a meal and brighten up a room. If you have any questions about this product by Couleur Nature, contact us by completing and submitting the form below. If you are looking for a specif part number, please include it with your message.